Video Camera Tilt and Rotate To rotate the Camera, select the Swivel and turn the Rotate dial. To tilt the camera, select the Pivot and turn the Tilt dial. 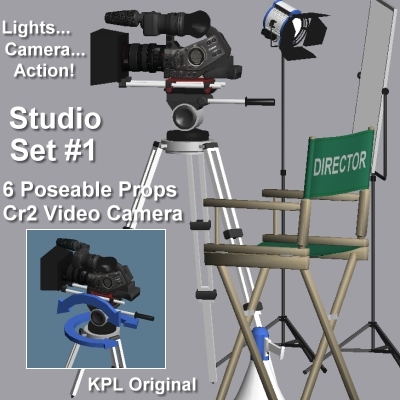 The video camera can be used seperately from the tripod by loading the Video Camera.pp2. SpotLight / Reflector Both the SpotLight and Reflector can be rotated on the tripod. Select the Spotlight or Reflector frame and turn the Rotate dial. The Reflector panel can also be tilted. Adding Scene SpotLight is pretty easy. After the SpotLight prop has been loaded, rotate it to face directly away. Add a spotlight to the scene and move it upwards to sit inside the housing. Then you can adjust it a bit to match. When it is at the correct angle parent it to the Spotlight (See image below). A Distant light can be positioned in front of the reflector panel to create the illusion of scene lighting. Mic Boom This prop is static at the moment. Because of the complexity needed to tilt the mic boom itself AND the attached weight bag, this feature is not available at this time. Check the website for the updated pp2.